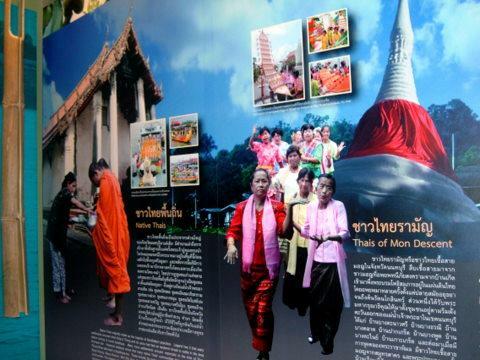 The Museum of Nonthaburi displays the history of Nonthaburi province, her people and the way of life, culture, arts and craft in a historical building to preserve the heritage of a very old province established in 1548. The museum, which opened on 15 September 2009, is near the Nonthaburi pier, the terminal pier of the Chao Phraya river boats that’s just north of Bangkok. It’s located in part of an old building with a long history. The building is now a national heritage in the process of conservation. The interior of the section housing the museum has been renovated. It’s extremely well organized with elaborate displays that are well laid out and illustrated by signs in English and Thai. Video screens on the relevant subjects are available in most of the rooms and can be activated at the touch of button. The commentaries are in Thai with English sub-titles. The staff members are friendly, helpful and well-informed. Questionnaires, suggestion forms, museum brochures and tourist information brochures are also available. The whole experience leaves the visitor with an impression of an efficient administration. 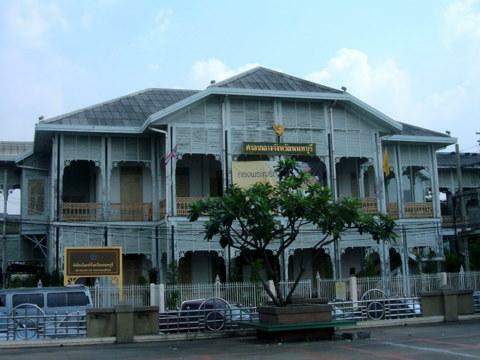 The building housing the Museum of Nonthaburi was built in 1910, the first year in the reign of King Rama VI. From 1911 – 1925, the King’s College occupied the premises. This college, started in 1897 by King Rama V, was a boarding school modeled after the British public schools. The college had to close down in 1925 owing to financial difficulties. From 1925 – 1992, the City Hall of Nonthaburi was located here. The building also housed the provincial office, court, treasury, district office, land office, public health centre and lodging for government officials. During World War II, patients from Siriraj Hospital were evacuated here in 1943/44 when the British bombed the Bangkok Noi railway station near the hospital. That railway station was the logistics railhead for the supply line to Kanchanaburi and onwards to the Japanese Army in Burma. 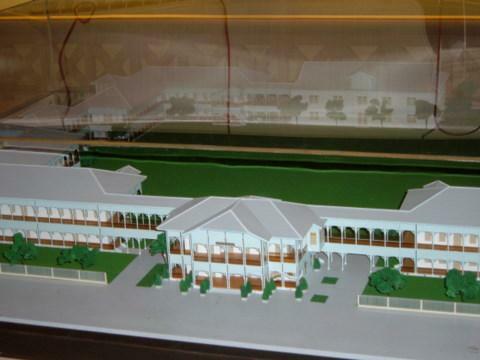 In 1992 the City Hall of Nonthaburi moved to Rattanathibet Road where it remains till today. The building was taken over by the Ministry of Interior as a training institute for senior ministry officials until 2008 when they moved out to new premises. 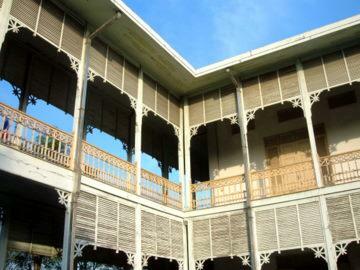 The following year the front section of the building was converted to be the Museum of Nonthaburi. More than a millennium ago, Nonthaburi like Bangkok was under water. The coastline then went as far north as Ayutthaya! Over the centuries, deposits from the Chao Phraya extended the coastline to its present position creating a fertile basin rich with alluvial soil. This accounts for why the province is famous for fruits orchards producing the delicious "kan yao" (long stem) durian, santol and plum mango. However heavy flooding of the low lying province in 1995/96 has damaged many of the plantations. Pollution of the river caused further damage. 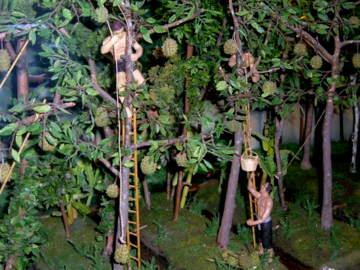 Efforts are now in progress to replant Nonthaburi’s famous durian trees. 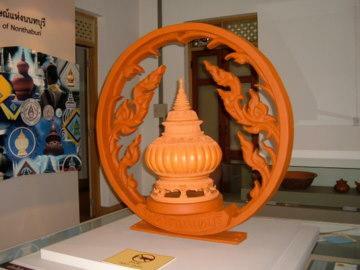 Nonthaburi is an old province created in 1548 in the reign of King Chakraphat of Ayutthaya. During this period Burmese invasions were a constant threat and settlements were established around Ayutthaya to serve as forward defences. 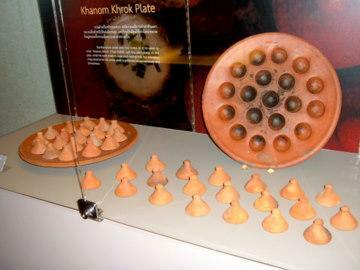 The early inhabitants of Nonthaburi include the Mon from Burma, Muslims from Pattani and Chinese immigrants. Owing to the sharp meanders in the Chao Phraya River back then, canals were cut at the base of the meanders to shorten sailing time to Ayutthaya. The first of these canals was in the Bang Kruai area in 1538. This remains a canal today. The third canal is at Pak Kred dug in 1722 thus creating the island Ko Kred. This canal is also the present course of the Chao Phraya today. The map below shows the long loops in the old course of the Chao Phraya, the present course and the locations where the canals were originally dug. View Chao Phraya in Nonthaburi in a larger map. Today, Nonthaburi is part of the greater Bangkok Metropolitan, the suburbs where many people working in Bangkok reside. Given the density of buildings and traffic there, you can hardly tell the difference from Bangkok. 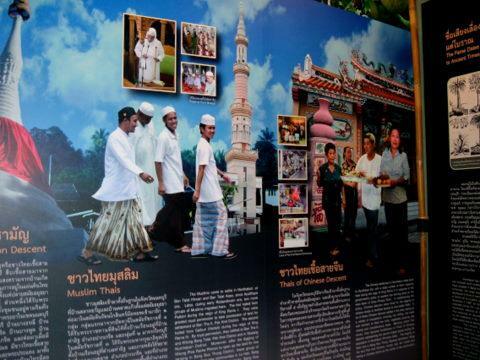 The Wall of Fame in the Museum of Nonthaburi honours Nonthaburi’s famous sons who gained national recognition. I recall two of them. The first was Plaek Khittisangkha who was born on 14 July 1897 in the city district of Nonthaburi. He became an army cadet at the Royal Thai Military Academy and later went on for further training in France. He later adopted his title as his name. History remembers him a Field Marshall Phibun Songkhram, a key member of the group that staged the coup in 1932 that changed Thailand to a constitutional monarchy. 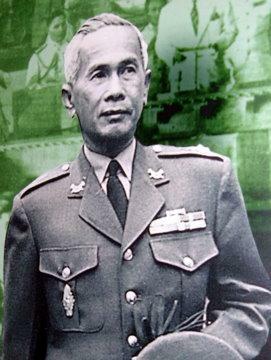 He became the third Prime Minister of Thailand from 1938 – 1944. In 1948 he became Prime Minister again until he was ousted 1957 and had to flee the country. He never lived to see his native Nonthaburi again. He lived in exile in Japan until his death in 1964. But Nonthaburi remembers Phibun Songkhram. There’s a road in the province named after him. So are three piers on the Chao Phraya River. Please see Phibun Songkhram – master of the coup d’état. The second famous son of Nonthaburi was Sakhon Yangkhiaosot. He was born 1922 in a boat to a family of travelling puppeteers who went around the province entertaining the people. At an early age, Sakhon learnt the art of puppetry from his father and continued with the profession when he grew up. In 1985 he decided to switch to a different set of puppets which were smaller than the ones he used to work with. The change became very popular and soon gained national recognition. 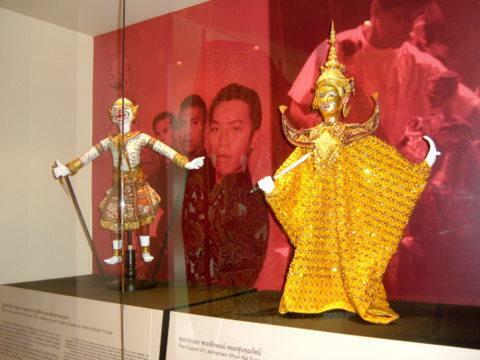 Master Sakhon was awarded the National Artist for Performing Arts for traditional small puppets in 1996. 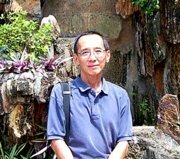 In 1999 he started the first puppet theatre in Nonthaburi and later moved to the Suan Lum Night Bazaar. 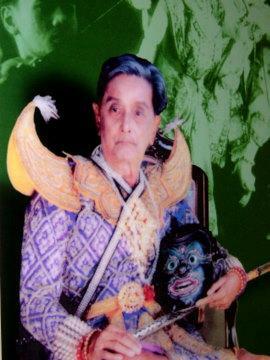 His performance was known as Sakhon Natasin Small Puppets Theatre. Later he renamed the troupe after his nickname adopted from the famous boxer in the 1930s who later became the world heavyweight champion. The troupe became the Joe Louis Troupe. In 2006 the Joe Louis Troupe won the World Puppet Contest in the Czech Republic. A year later on 21 May 2007, Master Sakhon Yangkhiaosot passed away after an illness. His funeral rites were conducted at Wat Bangpai, Bang Bua Thong district, Nonthaburi. 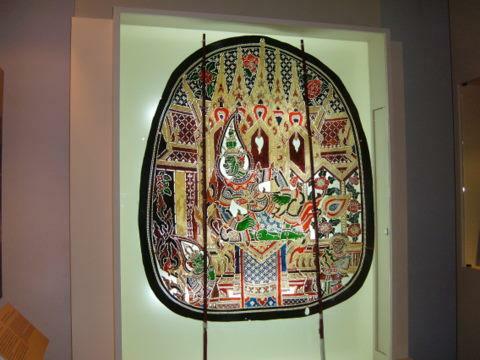 Besides the art of making puppets, other arts and craft of Nonthaburi province consists of traditional Thai paintings, shadow drama conducted with figures made from elaborately carved cowhide, Khon and traditional Thai dolls and of course the famous Nonthaburi pottery. 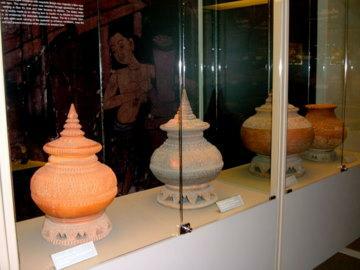 The second floor of the Museum of Nonthaburi is devoted to illustrating the traditional art of clay pottery for which Nonthaburi is famous. 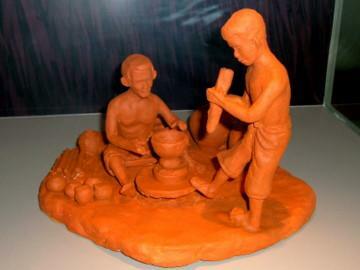 This craft is a heritage of the Mon who migrated from Burma. They settled in Ban Bang Tanaosi and Ko Kred. Pottery of various shapes and sizes are displayed here, so are the tools and implements used for shaping and carving the pottery. 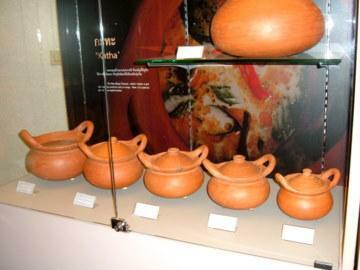 The pots below are still in use for the Thai steam boat. Street vendors use this device to make desert from sweeten batter poured into the depressions which are covered by the lids and heated. However, today the cheaper metal versions are mostly used. 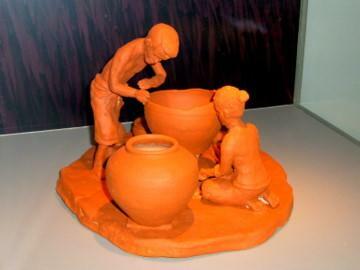 The traditional method of making clay pottery is well illustrated with clay figurines. 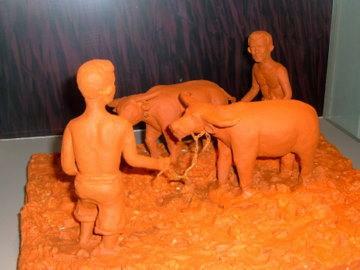 The clay is first dried in the sun before being trampled by water buffalos to tread it to the required texture. Sand is added to bind the clay. Wooden boards are placed below the buffalos for their droppings! 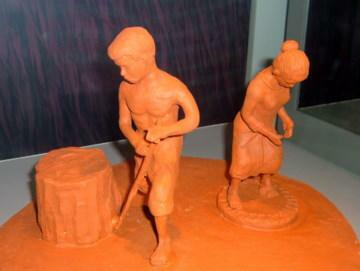 In the second stage, human feet tread the clay. In some cases, the potters tread and shape the clay into shapes of flower petals with their feet! 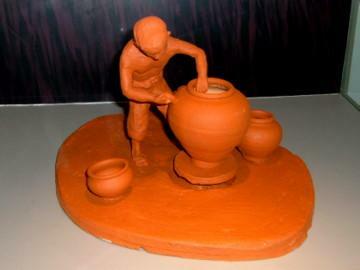 The clay is shaped into cylindrical tubes and balls which are then used to make the pottery. 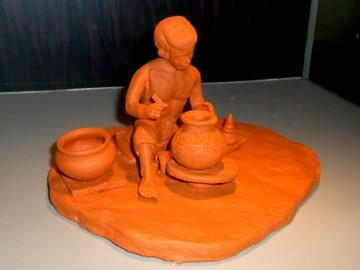 The clay is knocked into shape by wooden paddles and then spun on a rotating turn table as the potter skillfully uses his palms and fingers to mould the clay into the desired shape and contours. Fine shaping and polishing is done by stones, shells, sticks and coconut shells. Sharp sticks are used to engrave designs on the surfaces of the pots. 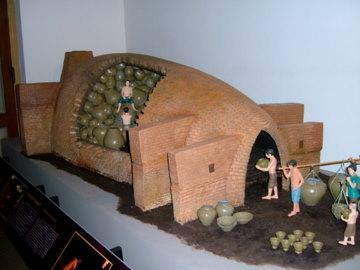 The pottery is then placed in a huge brick kiln and heated by wood fire for a month. However, the traditional potters are a dying breed. A video in the room shows an interview with the last of the potters, a 73 year old native of Ban Bang Tanaosi who was reminiscing about the old days when the craft was practiced by an entire community. 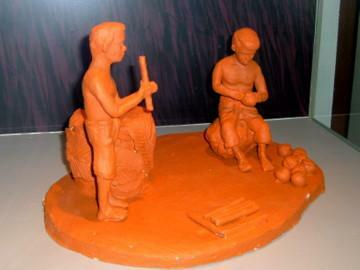 The sounds of wooden paddles knocking clay into shape can be heard all day long. 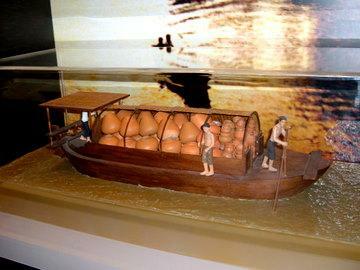 In the old days, the pottery is loaded in boats and sold to the surrounding provinces usually by barter trade. The boats sail out for these trading trips by convoys with entire families on board. These trips often take three months and families live, eat and sleep on the boats. On their way out, they plant rice on vacant plots along the river banks and harvest the rice on the way back. My sincere thanks to Khun Naraporn Pongsanay, Curator of the Museum of Nonthaburi, for kindly allowing me to photograph the exhibits in the museum. 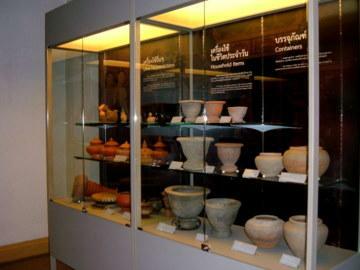 I am also very grateful to Khun Ning and her colleagues at the museum for their help and cooperation during my visits. When I first took up residence in Thailand in 2003, Nonthaburi was the first place I stayed. 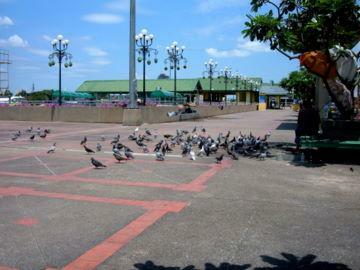 It was not far from the pier where the Museum of Nonthaburi is located. Back then, I had no idea of the rich history and culture of the province and its communities, as Nonthaburi wasn’t on the tourist map. I have always had fond memories of Nonthaburi and some of my happiest days were spent there. I am grateful to learn more about the province which was my first home in Thailand. View Museum of Nonthaburi in a larger map. Take a Chao Phraya express boat from the Sathon Pier to the end of the Nonthaburi Pier, the terminal pier. The journey by express boat takes about an hour. Leave the pier, turn right and walk along the esplanade by the river bank for about 20m. 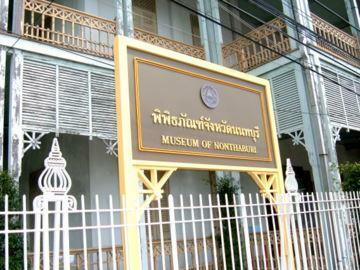 The Museum of Nonthaburi is just across the road. From Tuesdays to Sundays from 0900 - 1600 hours.